In May 2009, Ssangyong Motors, one of the largest auto companies of South Korea with over 100 multinational agencies abroad, submitted application forms on laying off 2,405 workers. The trade union declared a general strike against the unilateral mass dismissal in the name of ‘financial difficulties’. Ssangyong hit back with a lockout and sending blackmail to the workers to get them to register as a voluntary resignation. Several workers died from cerebral hemorrhage and heart attack. 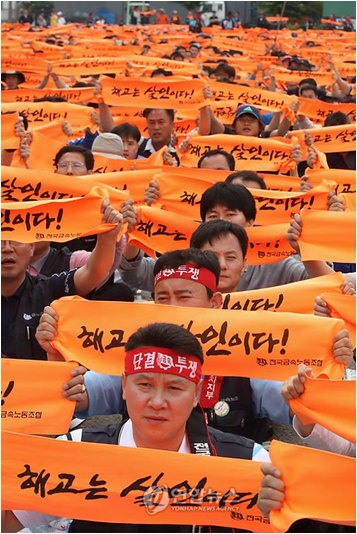 Workers occupied a main factory in Pyeongtaek and started a sit-in demonstration, which would become a 77 days of a harsh fight and one of the bloodiest persecutions of workers in South Korea’s labor history. On the 15th of July, Ssangyong started to completely block journalists from reporting the scene. 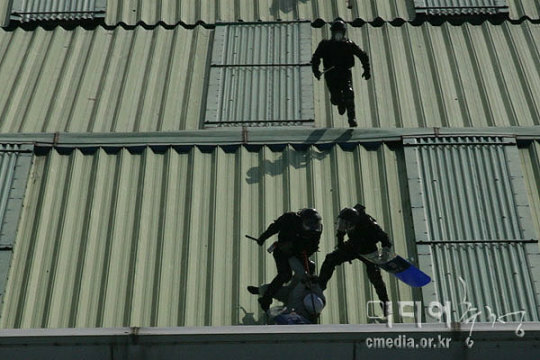 On the 16th of July, MBC news agency exposed a shocking joint plan of Ssangyong-police to ‘hunt out’ the workers demonstrating inside the Pyeongtaek factory. The leaked documents revealed that the two considered spraying incapacitating agents and flying helicopters all-night to deprive the workers of sleep. Ssangyong blocked food and water entering into the factory, which it confirmed in the press conference in 20th July. It also blocked doctors from entering into the factory to cure the rotting foot of a worker suffering from diabetes and other workers wounded from liquid teargas poured from helicopters. 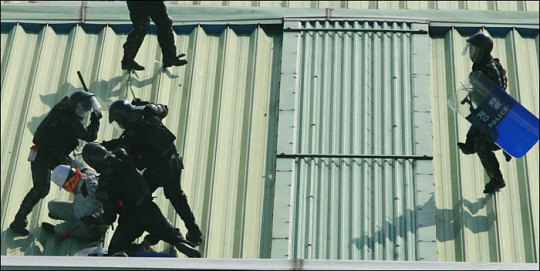 The battles started to become deadly fights, with armed police and Ssangyong’s hired private thugs in police uniform jointly acting in unrestrained violence to the demonstrators to ‘repress the deforcement’ beginning in 5th August, 4:00 a.m.
Armed police landing on the roof of the Pyeongtaek factory. Armed police beating defenseless workers on the 5th of August. 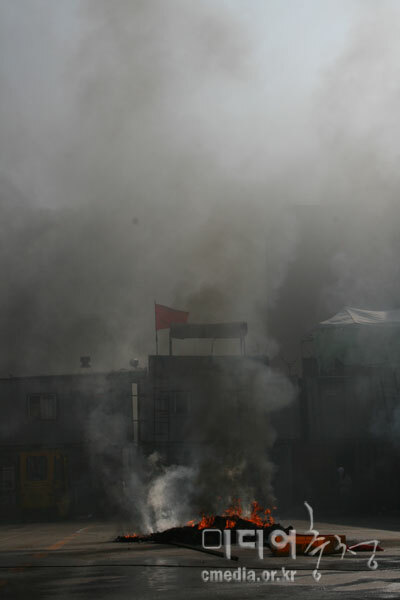 The police force resorted to unrestrained violence in arresting the workers including stabbing with blades of police shields and kicking and beating with batons while police helicopters sprayed liquid teargas and water cannons. 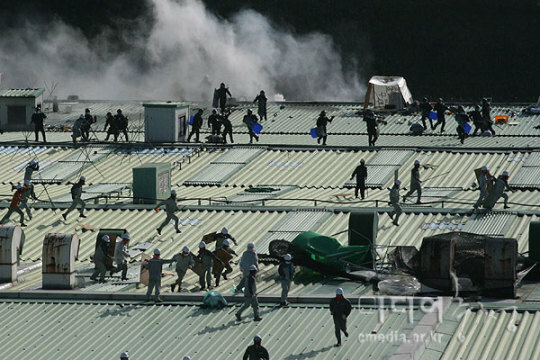 According to the inspection report by Korean Federation of Medical Groups for Health Rights, liquid teargas widely poured on the laid-off protesters by police helicopters contained a high concentration of dichloromethane. Dichloromethane is recorded as a second level carcinogen which is readily absorbed through the skin, an asphyxiant, and it causes CNS(Central Nervous System) depression according to MSDS (material safety data sheets), a globally used system categorizing safety information on chemicals. The report also noted that one sample taken from the ‘battleground’ was able to melt styrofoam and vinyl, and some protestors showedsigns of burns. The police arrested 96 workers among the ‘hunted out’ from the factory, despite the severe wounds of some workers, including broken bones and fatal cuts. Fifteen laid-off workers have died since the deadly battle. Among them six committed suicide. According to a report published by Workers’ Institution for Occupational and Environmental Health(WIOEH) in 2011, more than half of the laid-off workers showed PTSD (Post Traumatic Stress Disorder). 80% of the participants turned out to have been suffering from major depression after the event. Ssangyong refused to compensate, and filed a damage suit against the trade union members. It also showed no sign of meeting the formal agreement that it had with the trade union in August of 2009, which promises reinstatements of the workers who are on ‘unpaid leave of absence’, as soon as the company revives and enough production supplies are secured. “Dismissal Is Murder” has become a universal slogan since the ‘war’, whenever workers fight against unfair mass layoffs and corporations’ blunt crushing of labor rights. Hanjin is not an exception, and the number of its victims of mass dismissal in the name of ‘financial difficulties’ since 2007 totaled over 3,000 in South Korea, while the number of deaths due to industrial accidents since 2007 totaled over 30 in the Philippines’ Subic Bay. Cho Namho, the CEO of Hanjin (HHIC, Hanjin Heavy Industries and Constructions) was absent at a hearing conducted in the National Assembly opened to question the unfair layoffs and allegations of tax evasion at the time he constructed the Subic shipyard. The official cause for the absence was that he was ‘traveling abroad’. He finally arrived in South Korea yesterday, and held a press conference in which he arrived with a helicopter. Police blocked the demonstrators comprised of people and laid-off workers from the press conference site. 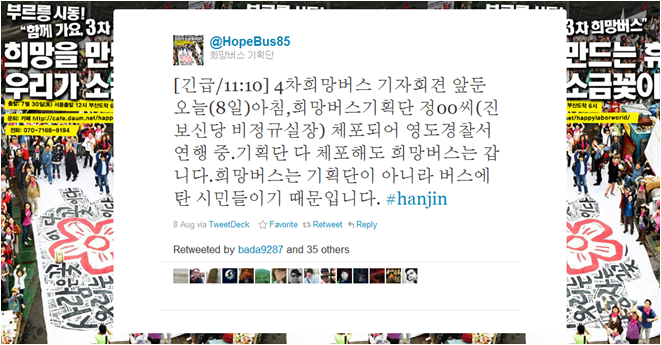 Cho stated that Hanjin would donate billions of wons to the Busan (where Youngdo shipyard is located) and to the education of the children of the laid-off workers, restricted to those who would accept the dismissal and ‘voluntarily resign’. Despite the promise of the huge donation, he still insisted that the layoff was inevitable due to the ‘financial difficulties’. The 3rd Hope Riders, a third festival in which people around the country ride down to the Youngdo shipyard to show solidarity and support to the crane protester Kim Jinsuk, ended peacefully with less violence compared to the 2nd. Although armed police blocked people from reaching the 85th crane, people gathered in a place not far from there and started the festival. 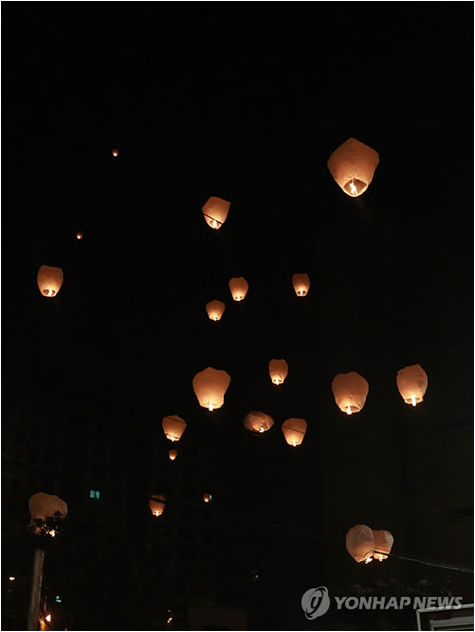 The all-night festival composed of public remarks of workers exposing misconduct from various corporations to famous labor rights activists’ speeches. Small rock concerts held as well. The 4th Hope Riders launches in Seoul, 27th August. One citizen. One dollar. One vote. 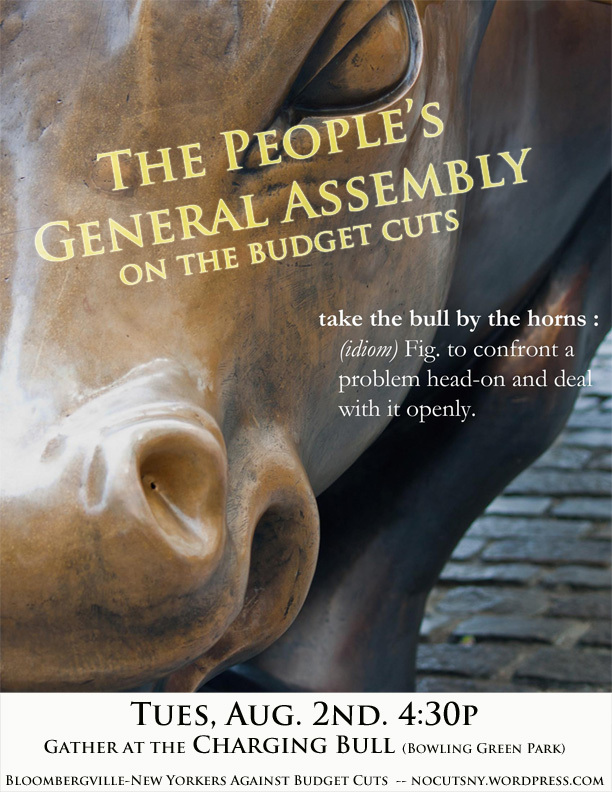 The US Day of Rage, a movement launched on March 10 of this year, appears to be taking off with the anger and frustration surrounding the ongoing debt crises this week. The movement describes itself as an“assymetrical self organizing political movement of ordinary citizens”, believes in non-violence and principles before parties (they are not affiliated with any political organization) and is volunteer only. They encourage individual state, city, and federal demonstrations to be autonomous, except in matters affecting the whole. Tomorrow is the first US Day of Rage protest, in Tennessee. “I have an army of teens who will help me….good kids wanting to do something about all this,” said Tennessee Organizer Lara Jennings. More states are organizing every day. Currently, Kansas, Tennessee, Idaho (September 16 Day of Rage), Indiana, Pennsylvania, Virginia, Seattle, Portland and Oregon are officially planning protests, and on September 17 the #occupywallstreet protest is scheduled to create an encampment protest at what is seen by many to be the epicentre of the problem. This is being planned here on reddit as well as Twitter. The official Twitter account is announcing all of the upcoming events and has just announced 8/2 at 4:30pm Gather at the Charging Bull (Bowling Green Park) Logistics for #Sept17 #OccupyWallStreet. Some sites are encouraging occupation of financial districts around the world on the same day.